“One becomes a champion when you see a player make his debut in First Division"
“One becomes a champion when you see a player make his debut in First Division" Gabriel Rodríguez, Coordinator of the Lower Divisions of River, spoke exclusively with the Official Site regarding his work with the formative categories. River was, is and will always be the greatest exponent of Argentinean football in terms of Lower Divisions, in training junior players for the First Division, the main contributor to the Argentinean National Team and the club that most exports elite players to all world football. Looking ahead to what's next, the official site had a deep talk with the Coordinator of the Lower Divisions, Gabriel Rodríguez. An undisputed connoisseur of this fundamental world within football and more than ever for the times coming, where most teams must turn to their youth divisions to form their squads and obtain genuine resources to grow and develop economically. Which characteristics do the young players need to have to play in River? River is different. The requirements are the same as those to play in First Division. Not anyone plays here. Besides the individual virtues, that are talent and ability, the player needs to have a good game vision and prioritize the group over the individual. The player must be ready to adapt to different situations, as well as to perform in various tactical systems. That is why we need to work with 14 or 15 years-old boys, so that in 2 or 3 years time they are suitable to play in Reserve and ready to make the leap to the First Division. As a result, River’s refined palate demands you to win, be liked and scored goals always. And, as the main condition, to play the same as in First Division. How do you prepare players that are able to reach First Division rather than forming champion teams? That is a very sensitive issue which can be discussed in several hours of talk. Amateur football still has not defined what is to form a player to be able to reach First Division. I always say that one becomes a champion when you see a player make his debut in First Division, after many years of work. Then, there is the annual championship. That is a reward for the young players, owing to their effort and dedication during training sessions and the sacrifice of playing the matches of all the year. For example, the Eighth Division recently became champion, and I feel happy for them. But the greatest satisfaction for me is to see them make their debut in First Division. In fact, if you have good players, chances are that you have good teams. Teams that mostly win. I lean towards the championship of the player who makes his debut and not for the one won in Lower Divisions." Do coaches need to be prepared to be teachers more than to win titles? The coach of Lower Divisions needs to be a constant formative influence and a teacher. Although he has a line of play and a style that he has to teach, we have to give him an integral formation as a future athlete. The best result is in the player we form and not in the championships we win. The fact that 75% of River’s Lower Divisions coaching staff played in River has an important added value. That is what makes invaluable for young players to receive advice from someone who not only played, but who won everything in this Club, and it helps them a lot to grow mentally for what is constantly demanded from them. Because some of them may experience that when they reach First Division. How is the selective formed? I always say that it is difficult to establish the degree and time for the evolution of the players at these ages. And it is not productive to hasten the logical times for maturity. I have seen many cases of players that showed great conditions and their times were hastened. They were taken to places of greater requirements and they did not respond accordingly because they were not mature in football terms. And, unfortunately, they stayed behind. The boys live with great anxiety and are in a hurry to fulfill their dream of reaching First Division quickly, without realizing that by skipping three steps, they can encounter difficulties. 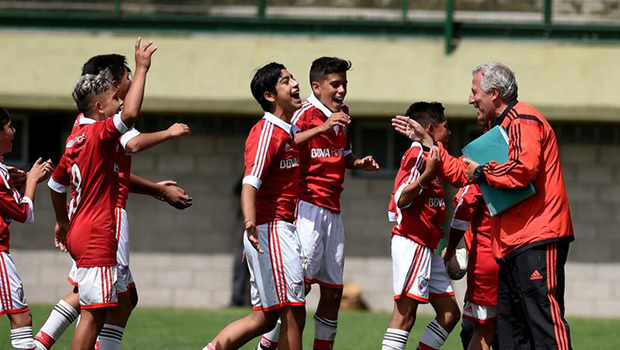 The need to be prepared mentally and in terms of football so that when they are 17 they do not think that because they are moved to the Reserve it is very easy to reach First Division. The personal environment also has a lot to do with this because it is fundamental to achieve the balance and support needed to fulfill that dream and keep their feet on the ground. We are constantly talking to them to calm their anxiety and go step by step, going through each stage. And I put into practice what the great master Don Adolfo Pedernera did, who said that you had to define yourself as a player and a person to be able to reach the First Division of River. Forming them as persons is also fundamental. It is essential. The cultural level is everything. Because some of them will reach high levels and they must be ready to face that different world. River in that aspect has a great behavior and demands that at the same time they play, they grow as a person. It is compulsory to study, there are psychologists that give them support and help them solve problems. There are nutritionists so that they do not have problems when it comes to diet. And the same happens with all other issues. They do not lack anything. We are continuously teaching and insisting that development as a human being is also fundamental. You have to follow them closely, because 85% of them are externally inculcated that the only thing that matters is to reach the top. And at River we strongly emphasize that they to be prepared to cope with life in case it is not their turn to reach the top. If there is someone who knows Gallardo well, it is you, who discovered him. What do you think of this initiative of boosting and having a revolutionary project in the Lower Divisions? I thinks that it is OK for him to add different purposes. Although he invests a lot of time in professional football, we talked about it several times: he wants to do a formative work, where not only the football player is respected, but he can add condiments that make him grow as a professional. To insert the pedagogical, nutritional, medical, psychological parts and to care of themselves as a person. He also insisted and managed to make worldwide model premises in Ezeiza, with a great financial effort of the Managing Board, in which not only the First Division, but also the Reserve and the three highest categories can be trained. This allows for 60 players to be trained alongside the First Division. Let them begin to live the River world at a professional level. And with some condiments that Marcelo will add. I am prepared for whatever he may need. It is his great moment. And then he can make all the changes that further enhance the growth of the Lower Divisions, which is vital for the football structure of the Club. In his term, 20 players have already made their debut. And I have no doubt that this project is going to pay off because he is going to apply everything he learned as a boy and will put into practice all the experience he already has as a coach. Gallardo has a sense of belonging for this Club that leads him to do things that remain in the history of River. And I am sure that making a project for the Lower Divisions will be successful in a short time. Lower Divisions will play the same as the First Division and fundamentally the players will be promoted as such and will be formed as human beings. And the main thing is that the majority of the professional squad is made up of players from the breeding ground. 06/07/2018 Fourth Division: River champ!